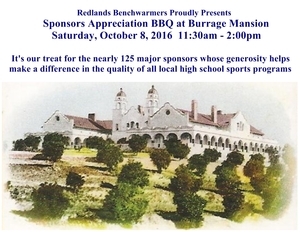 This Free Event is sponsored by the Rochford Foundation at the Burrage Mansion in Redlands California. It is open to all present and past Benchwarmer Sponsors who through their generosity make it all possible. This is our way to show you our gratitude. Come join us in the park like setting outside at the Burrage Mansion under the trees enjoying fabulous BBQ while listening to live Jazz music. Don't be left out. All of your generous friends will be attending. 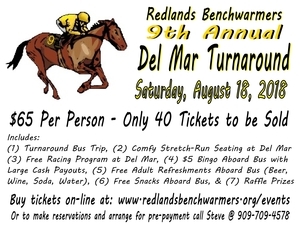 Join the Benchwarmers on their 9th annual turnaround to beautiful Del Mar Racetrack on Saturday, August 18th. The air-conditioned and chartered bus departs from Redlands High School south parking lot at promptly 10am and departs Del Mar immediately after the 9th race to return to Redlands by approximately 8pm. We'll have $5 Bingo for cash prizes with plenty of beer, wine, soda and snacks. We'll also have a gift raffle aboard the bus on the return home. The price is $65 per person and a portion of your donation is tax-deductible. Help us support high school sports. 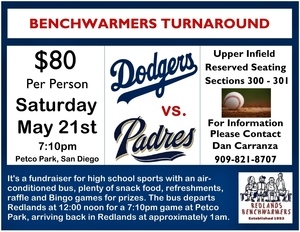 For reservations, contact Benchwarmers Treasurer, Steve Chapman, at 909-709-4578. Make your reservations soon because only 40 seats are being sold for this fundraising event. 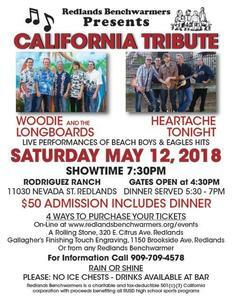 6:00PM - Banquet Dinner and Raffle Drawing at Mill Creek Cattle Co.
Join us on Saturday, May 12th at Rodriguez Ranch in Redlands for live performances of Beach Boys and Eagles hits as we welcome renown tribute bands, Woodie & The Longboards and Heartache Tonight. TICKETS ARE $50 EACH. 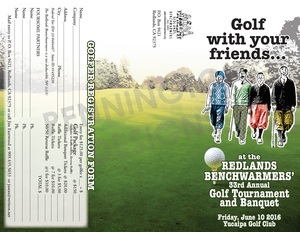 REDLANDS BENCHWARMERS IS A TAX-DEDUCTIBLE 501 (c)(3) CHARITABLE CALIFORNIA CORPORATION. Last year's Beatles tribute band, Ticket to Ride, was a huge success and California Tribute will be another great music fundraising event on behalf of all local high school sports programs. Please: No ice chests. We'll have a full-service bar with mixed drinks, domestic beers, craft-brewed beers, red and white wines, soda and water. 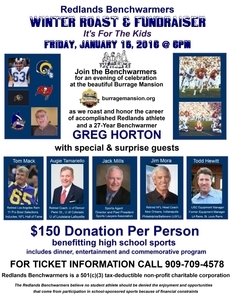 Join the Benchwarmers for their biennial "Winter Roast Fundraiser Event to be held at the beautiful Burrage Mansion. 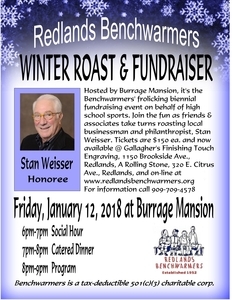 This year we honor an accomplished Redlands Businessman and renowned philanthropist, Stan Weisser. You will not want to miss this fun filled evening with Social Hour starting at 6 pm followed by a catered dinner and program of friends and associates taking turns Roasting one of Benchwarmers long time and loyal Sponsors. 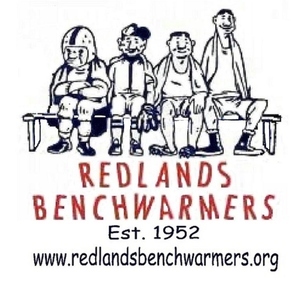 Founded in 1952, Redlands Benchwarmers is a charitable 501(c)(3) non-profit California Corporation. "Our Goal" is that no student athletes should be denied the enjoyment of high school athletics due to financial constraints. 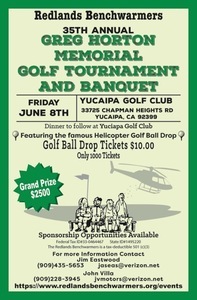 For details and questions, please contact our Golf Committee Chair, Jim Eastwood, at 909-435-5653. Be sure and mark your calendars for Saturday, April 29th. @ Rodriguez Ranch, 11030 Nevada St. Redlands, doors open at 4:30, dinner at 5:00-6:30, show 7:00 to 10:00. 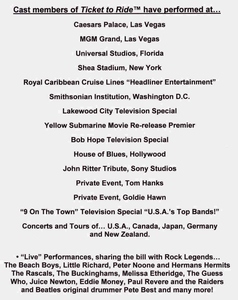 “Ticket to Ride” features the Country’s top Beatles sound-a-likes! Members of “Ticket to Ride” have traveled the World re-creating the Beatles “Live in Concert” sound. With authentic instruments and costumes. “Ticket to Ride” performs the Beatles most Classic and Greatest hits! Saturday, April 29th. @ Rodriguez Ranch, 11030 Nevada St. Redlands, doors open at 4:30, dinner at 5:00-6:30, show 7:00 to 10:00. 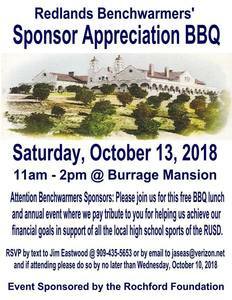 Over 125 major sponsors are being invited to this BBQ on Saturday, October 8th at the beautiful Burrage Mansion in Redlands as a show of appreciation for their generous donations to Benchwarmers and which has helped improve the quality of ALL sports programs of ALL high schools in the Redlands Unified School District. It's a FREE LUNCH. No donations are being asked. It's our way of thanking YOU, our sponsors. 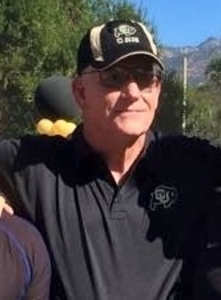 We're inviting several of the head coaches of the various high school sports programs whose programs YOU are supporting through your sponsorships. If you plan to attend PLEASE CLICK THE RSVP BUTTON. Thank you and we look forward to your presence. It's a fundraiser for high school sports with an air conditioned bus, plenty of snack food, refreshments, raffle and Bingo games for prizes. The bus departs Redlands at 12:00 noon for a 7:10pm game at Petco Park, arriving back in Redlands at approximately 1AM.